EnergyMax Silicone Coating is a high solids, silicone roof coating. The product has zero organic content therefore it does not become a food source for mold and mildew. Containers are filled with dry nitrogen gas to prevent premature cure. Breathable membrane has exceptional weathering characteristics, prevents moisture entrapment and premature roof failure. Not affected by ponding water. May be used for potable rainwater catchment applications. See listing at nsf.org for application and cure instructions for rainwater catchment use. Reflective roof coating reduces cooling costs. An excellent top coat for EnergyMax Aromatic Polyurethane. Complies with all of the requirements of ASTM D 6694-08 and -07 Standard Specification Liquid-Applied Silicone Coating and ASTM C1305 Crack Bridging Ability. Easy to use, non-toxic and VOC-compliant silicone roof coating. Resists ozone and harsh chemicals. Maintains flexibility even in extreme temperature ranges. Breathable membrane prevents moisture entrapment. Coverage 1.25 gal/100SF yields 15.36 dry mils. Up to 1.25gal/100SF per coat. 2 coats, 25 - 30 dry mils recommended. 45 mils for NSF approval. Cure Time Min 2 hours @ 100°F - 90% humidity. Max 8 hours @ 40°F - 20% humidity. For those that don’t have the budget for both the primer and EnergyMax you can primer now at a 10-15 mil and come back within two year to apply the EnergyMax! Warning:EnergyMax Silicone Roof Coating contains solvents. Keep away from open flame, heat or sparks. Pumping equipment should be grounded to avoid accidental ignition due to static sparks. Use only in ventilated areas and provide mechanical ventilation in enclosed spaces. Avoid breathing vapor or mist. Approved (MESA/NIOSH) chemical respirator and protective clothing must be used when exposure can exceed recommended PEL. Fresh air hose masks required for interior applications. Care must be taken to prevent rooftop HVAC from introducing solvent vapor into interior areas. EPDM Coatings must be completely dry before exposing to water or foot traffic. Keep EPDM Coatings containers covered when not in use. Dispose of all containers in accordance with state and local environmental regulations. Keep away from children. If ingested, DO NOT induce vomiting. Call physician immediately. Roof must be clean, dry and free of any oil, grease, dirt or loosely adhered coating. Bare surfaces must be prepared and checked for compatibility. EPDM Coatings recommends subsequent coats to be applied with 24 hours. Equipment: brush, roller, spreader or a 4000psi, 3gpm airless sprayer with a .031 tip. Use BUNA-N jacketed hoses for moisture protection. Do not leave coating in spray guns, hoses and pumps for prolonged periods. Follow our and roof restoration procedures and always perform a coating adhesion test before doing the entire roof. EnergyMax Silicone Roof Coating is available directly from EPDM Coatings and our authorized distributors. On pre-qualified and registered applications completed by EPDM Coatings-approved contractors, long term warranties are available. 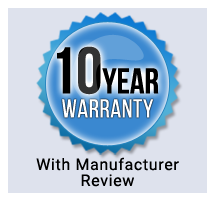 Contact EPDM Coatings for warranty information.